This text work presents multi font versions of the acronym CIA, echoing/mirroring the many covert guises (many in publishing and art funding) undertaken by the US Central Intelligence Agency in the political-cultural propaganda operations undertaken by the Congress for Cultural Freedom (CCF). 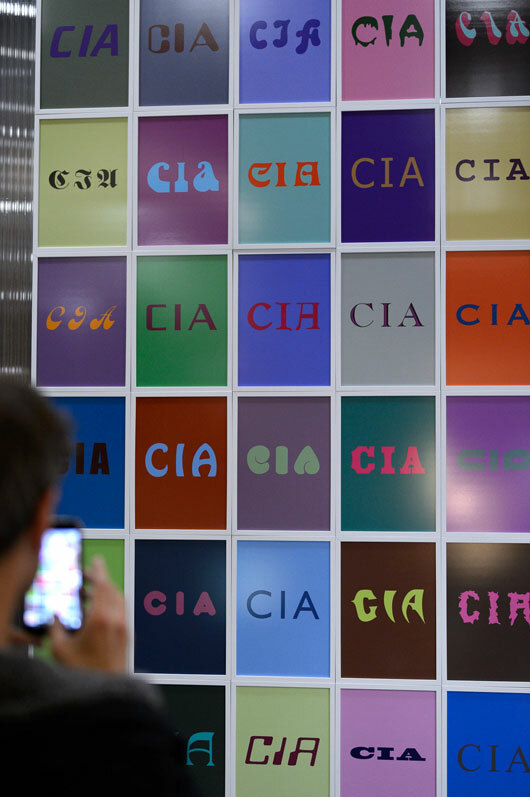 The work translates the name of the Agency into a pop-conceptual artwork, echoing the CIA's advocacy and dissemination of contemporary art as an expression of a free, peaceful, democratic and humane society, whilst the abstraction of the variously signifying fonts returns each time to the source of the propaganda, the name/acronym of the CIA itself. “They had stolen the great words,” a former secret service agent wrote in 1967 in an article titled “I’m glad the CIA is ‘immoral’.” He was defending a near-global covert operation supporting the Non-Communist Left during the Cold War. This “freedom offensive” was orchestrated to derail sympathies toward Russia among intellectuals. The cultural Cold War was a struggle over 'great words' and their meaning, with the aim of delegitimizing the other side and controlling the semantic field. In this mimetic arms race, cultural diplomacy was to play a decisive role. The term "parapolitics" refers to the use of soft power in the Cold War, encapsulated in the expression the "battle for Picasso's mind." The activities of the CCF contributed to the resignification of modernism as a way of disseminating a “politics of apolitical culture.” The exhibition is built around the ideological contradictions of this resignification and the moral ambiguities of celebrating cultural freedom and transparency by means that are themselves outside of democratic accountability. The project revolves around the use of art in shoring up an anti-communist consensus, and the strategies of artistic autonomy within this parapolitical choreography. The exhibition features numerous documents and archival material, including the journals and magazines Der Monat (Germany), Encounter (UK), Sasanggye (South Korea), Quest (India), Africa South (South Africa), Black Orpheus (Nigeria), Transition (Uganda / Ghana), The New African (South Africa), Hiwar (Lebanon), and Mundo Nuevo (Latin America), which were either initiated or temporarily supported by the Congress for Cultural Freedom and significantly influenced public opinion in the decades following the Second World War. Parapolitics brings together artworks from the 1930s to the present by artists that prefigure and reflect the ideological and formal struggles arising from the cultural Cold War, but also works by contemporary artists critically reassessing the normalized narratives of modernism. Curated by Anselm Franke, Nida Ghouse, Paz Guevara, and Antonia Majaca. Parapolitics: Cultural Freedom and the Cold War is part of Kanon-Fragen. Kanon-Fragen is supported by the Federal Government Commissioner for Culture and the Media due to a ruling of the German Bundestag. Haus der Kulturen der Welt is supported by the Federal Government Commissioner for Culture and the Media as well as by the Federal Foreign Office.